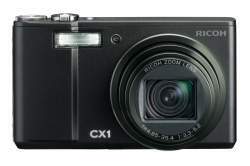 Ricoh has announced the new Ricoh CX1 digital camera that features a 9 megapixel sensor and a 7.1x optical zoom lens. Something more exciting about this Ricoh is the “dynamic range double shot mode” which let you combine two pictures with different exposures into one and thus expands the dynamic range in the photo. The camera will be available in March 2009 in Japan. Tokyo, Japan, February 19, 2009—Ricoh Co., Ltd. (president and CEO: Shiro Kondo) today announced the development and release of the CX1, a new digital camera with a 7.1x optical wide-angle zoom lens (28-200 mm in 35 mm film equivalent focal length). The CX1’s expanded dynamic range of 12 EV equivalent makes it possible to capture high-contrast scenes in a way not possible with earlier models. The CX1 has a large 3.0-inch 920,000-dot VGA monitor and high-speed continuous shooting functions at approximately 4 frames/second that make it even easier to enjoy photography. This is a digital camera that takes the design concept “A tool you will want to use every day” to a new level of perfection. • The CX1 has the new image processing engine Smooth Imagine Engine IV and a new high-speed image processing CMOS sensor. In high-sensitivity shooting conditions, these enhancements result in greater resolution than previous models and also reduce noise without compromising color reproduction. • The addition of a customized circuit to the image processing engine has made it possible to include a pixel output interpolation algorithm that expands the CX1’s dynamic range by up to 1 EV compared to conventional methods. This reduces whiteout in high-contrast situations and recreates the beauty seen by the eye. • The transformation of the image processing engine and the image sensor has enabled the CX1 to do high-speed continuous shooting. This, in turn, has made it possible to create dynamic range double shot mode, which takes high-speed consecutive shots of two still images with different exposures and then records an image that combines the properly exposed portions of each. Expanding the dynamic range up to a maximum equivalent to 12 EV, this mode makes it possible to record images that give an almost naked-eye impression. • It is possible to also record a normal image in addition to the expanded-dynamic-range image so you can check the results immediately after shooting. • For scenes with both shadow and sunlight and scenes mixing flash and natural light (or fluorescent light, etc.) during flash photography, this function can define white balance to fit the light source of each segregated area of the image. This enhances image quality in people-photography situations that were difficult to shoot with the old auto white balance function. • The large, high-resolution LCD monitor has a wide viewing angle and high contrast. The screen has a fluorine coat to prevent soiling, a hard coat to prevent scratches, and an anti-reflection coat to give greater visibility even outdoors in bright sunshine. • The optimum fonts are used for high visibility on the VGA monitor, and greater camera operability is achieved with an enhanced setting-screen design easily readable at a glance. There is also an 81-image playback screen display function useful when checking images during playback. • Image framing during shooting is now easier as a result of the addition of a shooting information display frame which does not superimpose shooting information over the image itself. • The camera automatically decides seven focus points and does high-speed consecutive shooting of seven images while shifting the focus to each point. After shooting, you can select the image with the preferred focus. This function is effective for scenes (such as flowers) where there is a narrow range for a sharp focus. • In continuous shooting mode, it is possible to do high-speed continuous shooting at approximately 4 frames/second for still images with the maximum number of pixels. • The M-continuous plus shooting function does continuous shooting that saves the 30 images (30 frames/sec.) taken during the one second or so before the finger is removed from the shutter release button or the 30 images (15 frames/sec.) taken during the two seconds before. By taking your finger from the shutter release just after the decisive moment has passed, you can be sure that you caught it. • With ultra-high-speed continuous shooting, the CX1 shoots 120 images (120 frames/sec.) during an interval of about one second after the shutter release button is pushed, or 120 images (60 frames/sec.) during an interval of about two seconds. • Ricoh’s original double retracting lens system has made it possible to fit a 7.1x optical wide-angle zoom lens in a body that is both easy to carry and easy to operate. • This lens can handle a wide range of shooting situations, including powerful telephoto shots as well as wide-angle shooting of both expansive landscapes and interior scenes with limited distance between camera and subject. • When shooting up close in easy shooting mode, the camera will automatically switch to macro mode so you can enjoy macro photography without the inconvenience of mode switching. 9. A wide range of functions inspired by the “A tool you will want to use every day” concept. • Electronic level utilizing an acceleration sensor. • Image sensor shift blur reduction function to reduce hand-motion blurring. • Face mode that automatically identifies subject faces and optimizes face focus, exposure, and white balance. • Easy shooting mode for photographic fun with simple operations. • Minimum shooting distance display function that shows on the monitor the minimum shooting distance, which changes depending on the zoom setting. • Aspect ratio (vertical/horizontal ratio) 1:1 square format photography function. • Image flag function to enable the quick display of specific images from among those in the camera. • The ability to switch from frame to frame with the still image display remaining enlarged in playback mode. Along with the A1100 IS we find the new Canon PowerShot A2100 IS compact digital camera. It features a bit more zoom (6x optical zoom) and a larger LCD screen (3″), but the A2100 does not have an optical viewfinder. The Canon PowerShot A2100 IS will be available in April 2009 and cost about $250. Amstelveen, The Netherlands, 18 February 2009: Canon today gives everyone the power to take great photos, with the launch of the 12.1 Megapixel PowerShot A1100 IS and PowerShot A2100 IS. For the ultimate in easy picture-taking, both models incorporate Canon’s new Scene Detection Technology – available via an improved Easy mode and new Smart Auto mode – for excellent results without effort. Featuring optical zoom lenses of 4x and 6x respectively, the PowerShot A1100 IS and PowerShot A2100 IS are powered by Canon’s latest DIGIC 4 image processor. This allows both models to deliver fast, responsive operation and outstanding, rich, detailed images. Replacing the A1000 and A2000 respectively, the PowerShot A1100 IS is available in blue, pink or silver, while the PowerShot A2100 IS features a classic black design. Both cameras are capable of capturing incredible levels of detail by combining a 12.1 Megapixel sensor with a high quality zoom lens – allowing you to enlarge or creatively crop images while retaining outstanding image detail. With a 4x optical zoom, the PowerShot A1100 IS delivers a range of flexible framing options, while the PowerShot A2100 IS delivers extra telephoto reach via a 6x optical zoom. Canon’s optical Image Stabilizer technology helps guard photos against the blurring effects of camera shake. Both cameras incorporate two fully automatic modes: new Smart Auto mode and an improved Easy mode. These use Canon’s Scene Detection Technology, which analyses the shooting scene in detail – assessing subject brightness, contrast, distance and overall hue – and selecting from a choice of 18 possible modes to ensure optimal results for any scene. Also featured are Motion Detection and Face Detection Technology, both of which offer improved performance thanks to DIGIC 4 processing. Motion Detection Technology prevents blur by registering camera or subject movement and adjusting settings to compensate; Face Detection Technology detects up to 35 faces in a frame and automatically adjusts key focus and exposure settings so everyone looks their best. Canon’s i-Contrast allows users to bring out hidden detail – for example, in areas of shadow – by brightening dark areas in an image without blowing out lighter areas. A wide range of shooting modes are available in each model, including dedicated Indoor and Kids & Pets modes. These take care of all the technical aspects of shooting in a host of common shooting situations. Users can choose to simply point-and-shoot for terrific results. Both models feature high quality movies, capturing 30 frames per second for smooth results. Frame and review images and movies on the large LCDs – the PowerShot A2100 IS features a 3.0” high resolution screen with five levels of brightness adjustment, and the PowerShot A1100 IS has a 2.5” LCD plus the convenience of an optical viewfinder. The PowerShot A1100 IS and PowerShot A2100 IS feature a dedicated Print menu for quick access to direct print options. Full PictBridge support means users can print directly to any PictBridge compatible printer without the need for a PC. A Print/Share button allows one-touch printing and easy uploads to Windows or Mac systems. The PowerShot A1100 IS and PowerShot A2100 IS feature a user interface that supports 26 languages: English, German, French, Dutch, Danish, Finnish, Italian, Norwegian, Swedish, Spanish, Simplified Chinese, Traditional Chinese, Japanese, Russian, Portuguese, Korean, Greek, Polish, Czech, Hungarian, Turkish, Thai, Arabic, Romanian, Ukrainian and Farsi. In addition to SD, SDHC and MMC memory cards, the PowerShot A1100 IS and PowerShot A2100 IS support MMCplus and HC MMCplus card formats. Both cameras are supplied with a memory card. * ZoomBrowser EX 6.3 (Windows), ImageBrowser 6.3 (Macintosh): For organising and editing images, movies and slideshows, or creating and printing digital photo albums. * PhotoStitch 3.1 (Windows), PhotoStitch 3.2 (Mac): For creating panoramic photos from multiple images. Purchasers of the PowerShot A1100 IS and PowerShot A2100 IS are eligible for free membership of CANON iMAGE GATEWAY: 100MB of online ‘personal gallery’ space for sharing stills and video with family and friends. * DIGIC 4 enables Smart Auto to be more accurate and give better images. 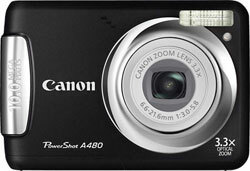 Among the all the digital compact cameras Canon announced today we find the Canon PowerShot A1100 IS. The A1100 IS camera features an optical viewfinder and the new Smart Auto mode from Canon. 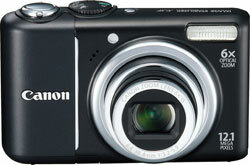 The Canon PowerShot A1100 IS will be available in March 2009 and cost about $200. 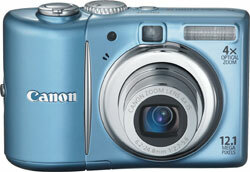 Canon has announced that they are releasing the Canon PowerShot A480 compact digital camera on the US marked. This camera was unveiled in Europe about a month ago and now Canon think it will fit on the American marked too. The Canon PowerShot A480 will be available on the US marked in March 2009 and cost about $130.